At the age of 24, Keith Bitamazire had an experience in Kenya that inspired him to do something about saving forests. He hated the country’s climate because it was very hot and believed it was as a result of not having enough trees. He never wanted the same to happen in Uganda, especially in the region where he would settle. When he returned to Uganda in the 90’s, with the help of his late uncles, his love for nature together with his small savings, he managed to purchase a piece of land which had a heavily depleted natural forest in the district. I decided to enrich the forest with indigenous tree species like mahogany, and though I still face many challenges, I have managed to keep it standing for 33 years now. Keith is one of the private forest owners in Masindi, one of the Bunyoro districts that the Jane Goodall Institute (JGI) is working with to ensure that he keeps his forest standing. Though he holds a Bachelor’s degree in civil engineering and was even once a pilot, he chose a life of conservation and now owns this 85 acre Rwangara / Siiba forest. Bunyoro is one of the regions in Western Uganda (Albertine Rift) where five of the largest Albertine rift forests including Budongo, Bugoma, Kibaale, Kalinzu and Kasyoha-Kitomi are found. These forests provide habitat to at least 75% of the 5,000 or so chimpanzees currently left in Uganda, but for decades they have continuously faced persistent degradation as a result of illegal logging and small scale agriculture. Keith’s forest is connected with Budongo Forest, and creates a large corridor for chimps and other wildlife. Over the past decade, JGI has been supporting Keith in various ways, especially with more seedlings of indigenous tree species like; mahogany, Prunus africana, muvule (Milicia excelsa), Mitrigyna and musizi (Maesopsis eminii), to enable him restore the forest, as well as exotic tree species like pine for him to harvest and earn income. The indigenous trees species which he received from JGI have not fully matured since species like Mahogany can take to over 60 years to grow to maturity. 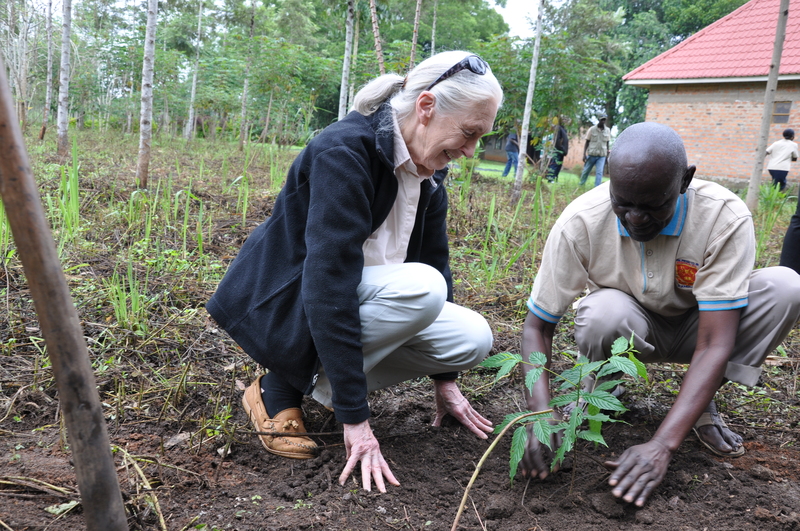 Dr. Jane Goodall and Keith together with his family after planting a tree seedling on his Rwangara / Siiba forest in Masindi district. Photo by Brenda Mirembe. I had chimps in my forest; I wanted to find ways to get rid of them because they could come to my compound and eat my fruits leaving my children complaining. But when JGI came to me preaching the necessity of conserving wildlife and the forests gospel, they changed our attitude. Now we live in harmony with these animals, I and my children have come to like them, chimpanzees come to my compound and eat or take my Jack fruit and we don’t mind, I have even planted more fruit trees for them both in my compound and in the forest. He has also engaged his children to take an interest in trees and forest conservation and so far they have planted trees on land he allocated to each, doing a well in taking care of these trees. He believes even after he passes on his forest conservation dream will not be put to waste since the children now have a love for biodiversity too. I am grateful though; I have not planted these trees for my benefit but for my future generations who will manage to follow my footsteps. The existence of this forest goes far beyond simply preserving chimpanzee habitat and biodiversity. Communities, especially the women living adjacent to his forest, are very grateful for his efforts since he made the forest accessible to them. These women can now go in and collect forest products like herbal medicine and fire wood (only dead/fallen wood). Keith also notes, for example, that during severe dry seasons, the only accessible source of water is his forest, where villages trek from long distances to collect water. Over view of Keith’s Rwangara\Siiba forest as seen from the boundary. Photo by Brenda Mirembe. Most men here call me stupid that am not earning money from my land. 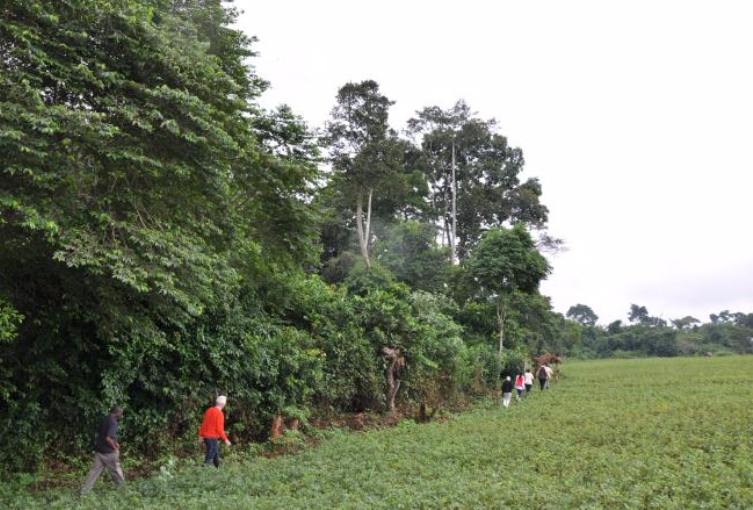 [They say] harvest the forest at once, sell the timber and build a hotel or convert it for sugarcane growing and earn more than 40 million (about $10,000) per harvest since it is the booming business in the area. [sic]But I do not care what they think because they do not understand what am doing. 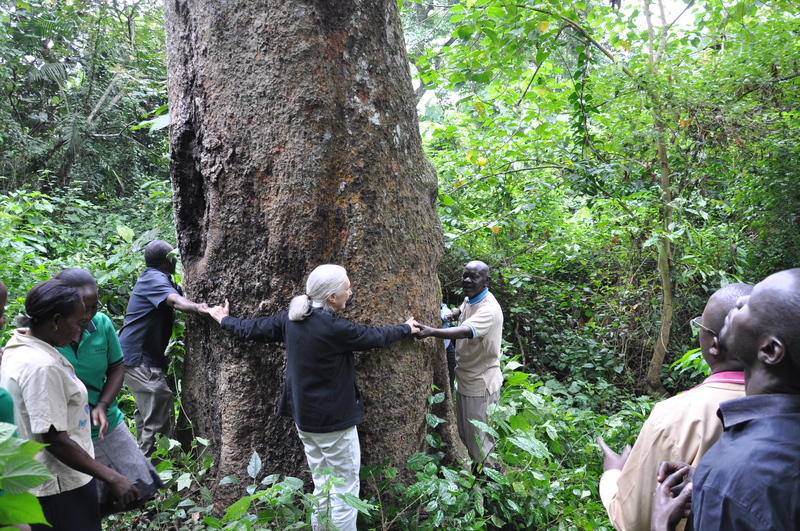 Keith Bitamazire and Dr. Jane Goodall hugging a Mahogany tree which is estimated to be over 100 years in his Rwangara / Siiba forest. Photo by Brenda Mirembe. In addition to conserving his forest, Keith is involved in other income generating opportunities, especially in agriculture and has acres of mangoes, ground nuts, onions, ginger and many others. This has enabled him to reduce direct dependence on his forest for survival. He has used this knowledge to advise his fellow private forest owners to also engage themselves in alternative income generating activities to keep their forests thriving as he has. “If you love the trees, you can sustain them,” he says. 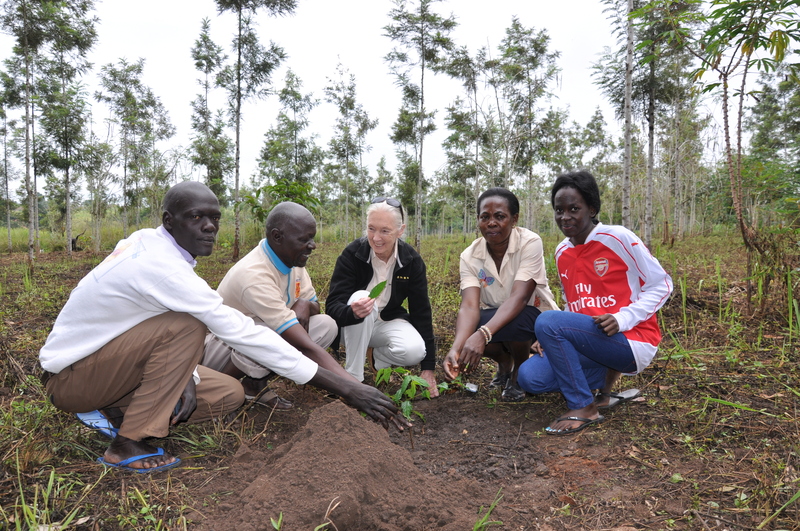 He thanked JGI for continuously supporting him with tree seedlings since these are not only helping him in forest restoration, but he has also been able to distribute some to other communities in the neighboring districts like Nakasongola, who are now also planting trees. Thanks to JGI now I am a care taker taking care of my forest on behalf of everybody in the world.